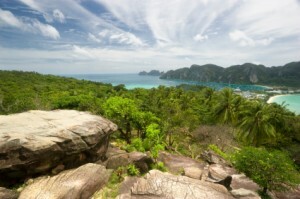 Located just 15 degrees north of the equator, the kingdom of Thailand has a tropical climate and temperatures typically range from 19 to 38 degrees Celsius, making it a perfect place for a motorhome holiday in the sun. The weather in Thailand is generally hot and humid: a great place to spend a lot of time enjoying the outdoors with a motorhome hire holiday. There are five regions of Thailand: North, Northeast, East, Central, and South, which are divided into 75 provinces. Thailand is one of the world’s favourite travelling destinations and it is easy to see why – more and more people are choosing to hire motorhomes in this fascinating country. From its shambolically exciting capital, Bangkok, through to the epic white sands of some of the world’s most beautiful beaches, Thailand manages to cater for the diverse tastes of any motorhome hirer. Take your motorhome hire thailand on a visit to Bangkok, the county’s capital: a sprawling metropolis with a night life which is both electric and thrilling. Through the city flows the Chao Phraya River, on the banks of which visitors will find the Grand Palace. Here also is Wat Phra Kaeo, a temple complex which houses the famous Emerald Buddha. Within the city motorhome users can see a wealth of over 300 Buddhist temple and shrines. Most famous are Wat Benchamabophit (Marble Temple), Wat Arun (Temple of Dawn) and Wat Trimit (Temple of the Golden Buddha). Upriver is the old capital of Ayutthaya and the old summer palace at Bang Pa-In, both of which are a must see for motorhome travellers interested in Thailand’s historic past. Another popular motorhome destination is the Central Plains, located between Bangkok and Chiang Mai, forming the heart of the country: a rich environment steeped in history. Take your motorhome to the province of Kanchanaburi, a stunning oasis of jungle-clad hills and sweeping waterways, where there is a popular train trip running along the ‘Death Railway’. Or travel to the northeast of the country to the Khao Yai National Park & Wildlife Reserve, which can be used by motorhome travellers as a base to visit the many ancient and historical sites in the northeast of Thailand. The coastline of Thailand is famously beautiful and makes a wonderful destination for those wishing for a chilled out motorhome holiday. Check out Ko Taoif if you are interested in scuba diving or relax in the stunning seascape of Phang Nga Bay, the setting for James Bond film, The Man with the Golden Gun. The idyllic Ko Phi Phi Islands are a quick boat trip away from Phuket or the mainland at Krabi and should be seen as a great example of island paradise. Alternatively check out Ko Phangan if you are looking to take your motorhome to somewhere relatively undeveloped but lively. Each month there is an all-night full moon beach party at Had Rin with up to 10,000 revellers partying until the sun comes up. All in all Motorhome Hire Thailand offers wonderfully tasty food, interesting activities, and friendly people. A perfect place to go for an unforgettable motorhome experience.